The 2007 session interns had the opportunity to meet with a variety of national figures, including future President Barack Obama. 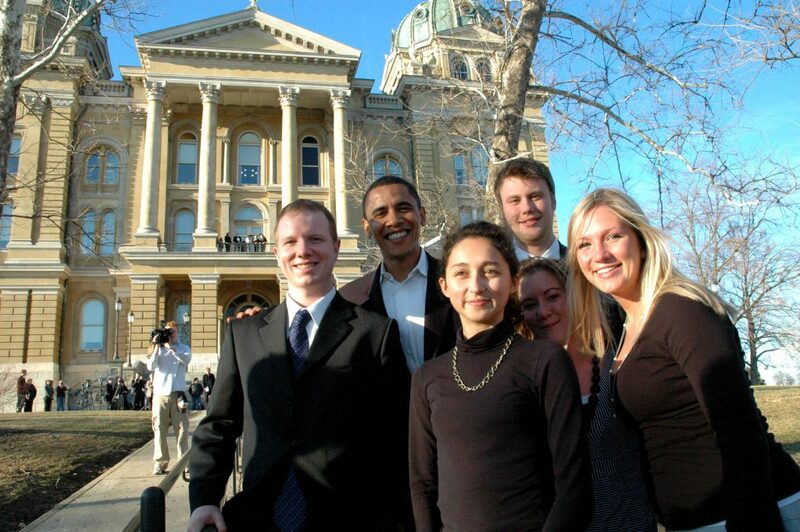 Pictured from left: Joe Winn, Sen. Barack Obama of Illinois, Soheila Yalpani, Kassie Hobbs, Camden Ackerman, and Amy LeBlanc. The Iowa Senate Democratic Research Staff supports the work of the Democratic members of the Iowa Senate. We are a team of 14 professionals who research various policy areas in support of the goals and interests of our Senators; communicate with constituents and the media; and offer administrative support. Our staff members help draft new legislation, track the movement of bills, provide constituent services and help Senators stay in touch with citizens in their districts. We can be found at press conferences and committee meetings, working on the floor of the Senate Chamber, attending closed-door meetings of the Democratic Caucus, or working at our offices in the Statehouse. Interns work closely with our staff’s communications team and with Democratic Senators from across the state. Previous interns have attended Drake, Grinnell, Simpson, Grand View, and Iowa’s three Regents Universities. Interns often come from majors in political science, public administration, journalism and communications. 2016 session intern Rob Uniacke operating a camera in the Senate Chamber. Read what four interns had to say about their experience here. All interns must be computer literate, organized and work well with others. Internships occur year-round, but we are particularly interested in a few good candidates to work throughout the legislative session (January through April/May). Unpaid interns must be at the Capitol a minimum of 14 hours each week. Applications for unpaid internships may be submitted any time. Interns work in our offices throughout the year, including the January portion of winter break or during spring break. If you have a question about whether your time fits our needs, please ask. Caucus Photographer: This intern is be our top photographer and helps oversee other interns who also take photos for distribution to local newspapers, websites, and newsletters. Our caucus photographer must consistently taking great photos, write and edit effective captions, prepare photos for distribution to local newspapers, websites and newsletters, and manage a large photo database. Finally, our Caucus Photographer must be reliable, well-organized and work well with others. Newsletter Intern: This intern will work with senators and staff to produce and distribute electronic newsletters and newspaper columns. They will work with subscriber databases, maintain local events lists, update blogs and Facebook accounts, and produce printed handouts. Experience with Excel, solid grammar skills, writing, and proofing skills are required for this position. 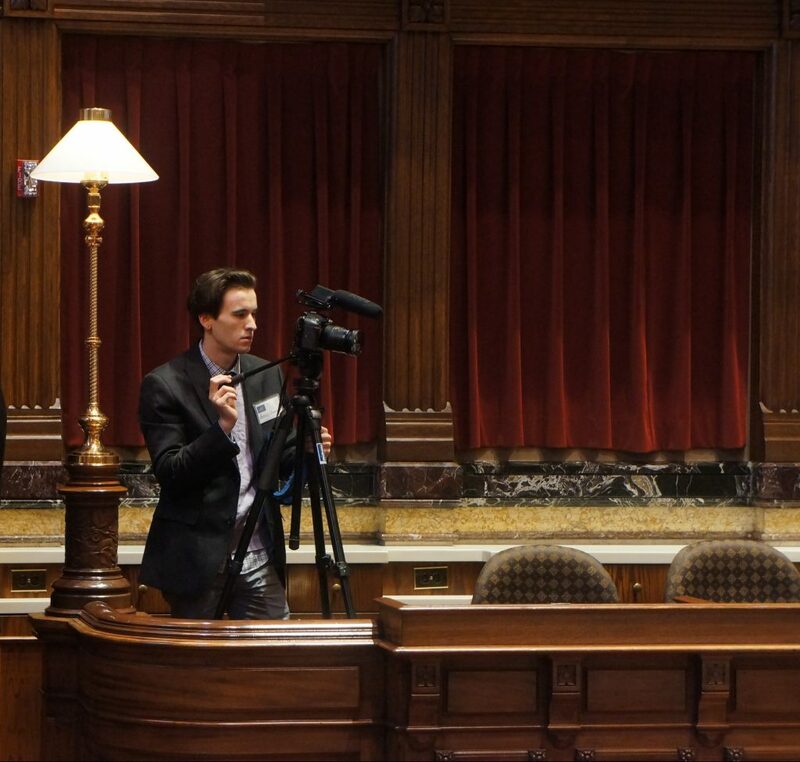 AV Intern: This intern will work with senators to record and distribute video content to social media. Strong written communication, organizational, and interpersonal skills are required. While experience in audio and video production is helpful, it is not required.